Hollywood, CA – World famous movie star and maverick is adamant that Scientology is not a hoax. Our affiliate Hollywood reporter, Tojo Saxton, has some interesting new information about all this. FMO: Tojo, what’s going on out there?! TJ: Well, as one of Scientology’s top gun leaders, Tom Cruise feels so strongly about this whole matter that he will soon be launching a bus tour called the “Not A Hoax” Cruise Bus. It’s slated to hit all 57 states, and bring convincing evidence to the people that Scientology is definitely not a hoax. FMO: What sparked this whole bus tour concept? TJ: Tom Cruise is very passionate when it comes to this subject. He believes that people who choose to speak out against Scientology “don’t know didley squat”. He does admit that the infamous South Park episode really hurt his church, especially the part that explained “This is what Scientologists actually believe”. FMO: Do you have any details about the cruise bus? TJ: Yes. Apparently the bus will be fully equipped to help Tom in his quest to demonstrate that Scientology is for real. Tom and his staff will be able to analyze prospective new members and get them signed up. 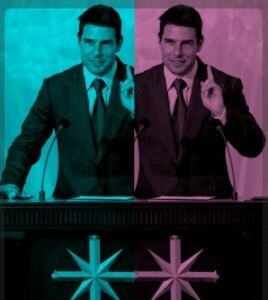 At that point, Tom usually recites his famous phrase, “Show me the money!”, as Scientology is far from free. Mr. Cruise believes that by proving his system of religious beliefs is not a hoax, many folks will want to begin their own personal Scientological journey, if you will. Tojo Saxton has a Masters degree in Celebrity Studies from UCS (University of Celebrity Studies in California) and has been a latent affiliate reporter for FMO since OJ was locked up.